[vc_row][vc_column][vc_column_text] Completing daily chores is a major challenge for parents of young children. Folding laundry, cooking dinner, and cleaning the living room is twice as difficult with a baby in hand. So for many parents, baby containers (such as jumpers, bumbo seats, and exersaucers) becomes the simple solution! Although baby containers are a convenience for many parents, it is detrimental to the child’s development. The major issues with container play are the child’s positioning and lack of tummy time. The bumbo seat was designed to seat young babies who were not able to sit up by themselves yet. Placing your child in the bumbo seat before they are developmentally ready for sitting can interfere with the natural progression of necessary skills. These four goals will help determine if your child is ready to sit: good head control, development of trunk muscles, flexibility of leg and hip muscles, and ability to take weight on arms. The bumbo is very limiting to a child, which inhibits strengthening of trunk control. Although jumpers and exersaucers allow more movement for a child, they also encourage poor child positioning. Notice the child’s position in the picture above. His head is tilt back, shoulders up high with his blades pulled back, hips pulled far apart by the stiff piece of fabric and his back is arched severely. A child is not properly using their gluteal or core muscles when their back is arched and their tummy is forward. Strong core muscles are crucial for most gross motor development. Exersaucers may cause a child to become a toe walker because of the poor standing position they encourage. When a child is in an exersaucer, they are on their toes and their knees become locked. It also deprives the child from looking at their feet, which provides balance when learning how to stand. Lastly, if a child spends most of their time in a container they are lacking a sufficient amount of tummy time. Tummy time is crucial for the strengthening of the neck, back, tummy, arm, and leg muscles. Tummy time is a great time for the caregiver and baby to interact while the baby is exploring his or her new environment. If your baby is able to sit with minimal support, play with your child while he/she is seated on the outside edge of the saucer rather than placing him/her in it. Ensure that your child has adequate head control, core strength, as well as arm and leg strength before putting him or her in a container to play. 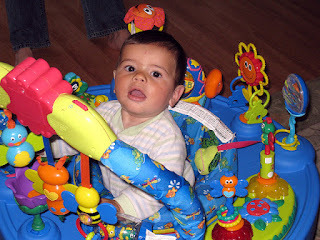 Detach toys from the exersaucer and play on the floor or coffee table. If your child is learning to stand, play on the outside of the saucer with your baby holding on to the tray. Some saucers are able to deconstruct into a baby play table. Look at this one! Encourage babbling and communication by interacting with your baby while in the exersaucer. If your child is able to sit independently, consider a playpen instead of a bouncer/exersaucer while you are completing your chores. It may be unrealistic to completely eliminate container play while you complete your never ending to-do list, but minimizing the amount of time a child spends in a container is crucial. Limit container play to 15 minutes a day, and allow 20 minutes of tummy time. Chanda. "Are Jumpers Bad For Babies?" Pink Oatmeal. N.p., 31 Mar. 2014. Web. 09 Mar. 2016. Christie. "Exersaucers: The Good, the Bad, the Better." Mama OT. N.p., 03 May 2012. Web. 09 Mar. 2016. Hobbs, Bridget. "The "Container Play" Lifestyle." North Shore Pediatric Therapy. North Shore Pediatric Therapy, 04 May 2011. Web. 09 Mar. 2016. Talmud, Rebecca, DPT. "Beware the Bumbo Seat." Mama OT. N.p., 15 July 2013. Web. 09 Mar. 2016.